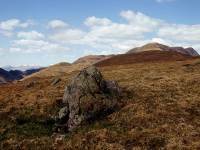 It's about seven miles from Callander to the summit of Stuc a' Chroin, and a third of this distance lays along an unclassified motor road running north from the town to a couple of isolated farms. The road passes the golf course north of the town, and then climbs steeply through woods. It's ascending the Highland Boundary Fault, of course. Not everyone is the same, but I find that a steep ascent early in the walk is a real stamina sapper and will leave me less able to tackle the legwork later on. If you have a car you can save yourself some appreciable early effort by driving to the end of the road. In this shot I'm clear of the woods about an hour after starting out. 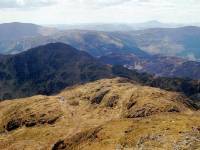 Stuc a Chroin is the summit just left of centre, while the Perthshire Ben Vorlich lies to the right. The road is following the valley of the Kelfie water, seen down to the right. A bridge over the Kelfie. You come to the first of two car parks here, from where a footpath crosses the Kelfie to lead down the riverbank towards the Bracklinn falls. The woodlands further down the valley featured in the film, "Monty Python and the Holy Grail", so if you venture down this way be on the lookout for the Knights of Ni. And remember to have a shrubbery handy. The road is gated at the first car park, so drivers must stop to open the gate (and close it again behind them!) before stopping at the second car park half a mile further on. You walk through the yard of Braeleny Farm after the second car park, where tarmac gives way to a rich brew of mud and slurry. Cattle graze the pastures beyond the farm. 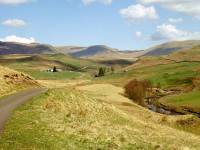 The route now lays along a vehicle track through a lonely tract of moorland, heading for the junction of two burns (Allt Breac-nic and Allt a Chroin). The map is ambiguous about the presence of a bridge here but you need not worry. From the bridge you can see the remains of a ford and an old wire footbridge (seen in the picture). Half a mile north of the bridge is the cottage of Arivurichardich, presumably an old shepherds cottage but now being refurbished as a private bothy. 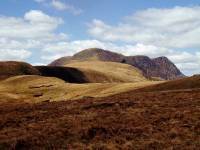 The vehicle track gives out and you progress now on a simple path, gradually climbing the eastern slopes of the Gleann a' Chroin. 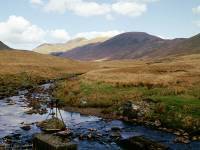 The glen holds a small reservoir, seen here in retrospect. Watch for the path junction one field beyond the cottage; the path leading straight on runs into the glen and peters out so be sure to tackle the (apparently lesser) path heading up to the right. This is where the terrain gets trying, for like so many Scottish moorlands slopes this area is rent with streams and patches of bog. Progress is slow and tiring and you just know that it will be even worse on the descent. After yesterday's climb of Ben Ledi and this morning's exertions on the road section I was feeling the effort badly and wondered if it was wise to go on. In these situations your ultimate goal seems impossible so you divide the task down into manageable chunks and tackle them one at a time. "I'll just get to that rock a couple of hundred yards ahead and see how I feel," I kept telling myself. "I'm not in the Marines, I'm doing this for fun. If I don't make the summit, so what? I'm still having a nice walk." 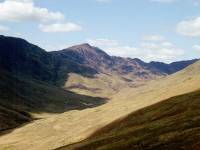 And it was rewarding already, with scenes like this - a view across the glen to the Corbett of Beinn Each. So in this manner I just got to the col, then I thought I'd just tackle the steep 300ft rise to the main ridge. It took me half an hour to get up that slope but beyond it was this reward - a relatively gentle, grassy ridge walk most of the way to the summit dome. Suddenly I'm flying. 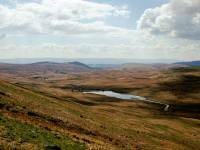 This is what it's all about - the great outdoors, empty country, big skies, glorious views. So refreshing. 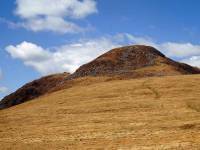 The summit dome of Stuc a' Chroin is a mile and a half ahead and doesn't look quite so unattainable now. Plenty of sunshine and the day is warm, even at 2500ft. 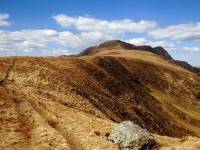 Half a mile of ridge walk glides by. It's starting to get steep again. Since it's well past 1pm I decided to stop here and declare lunch. A look back at the ridge walk from the foot of the summit dome. It took getting on for an hour to climb the summit dome. I rested more than I climbed. I was very fatigued and it didn't help that I'd just had lunch. But with rewards like this view to sustain me, it was worth the effort. The top! 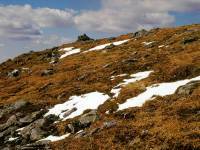 Still patches of snow here. 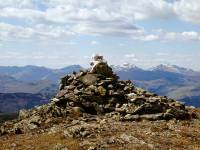 Stuc a' Chroin has two summit cairns. 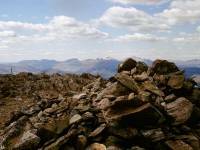 This is the western cairn, with a view of Ben More and Stobinian behind. A view to the northwest from the cairn. Lochearnhead and the western end of Loch Earn are in view. 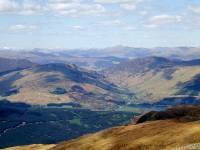 Some of the Glen Lyon and Rannoch Munros are seen. Can't put a name to any of them I'm afraid. Looking to the northeast here from the main cairn. 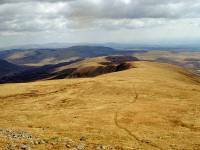 Ben Lawers is to the left, and that's probably the Mounth or the Cairngorms to the right, a good fifty or sixty miles away. Looking west. 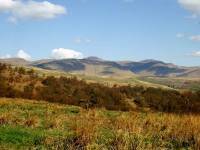 Beinn Each is in shadow across the glen, while Ben Ledi is in sunlight five miles away. We can see Ben Lomond on the skyline to the right. 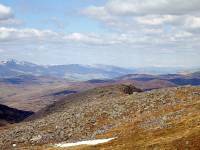 Ben Lawers seen from the main cairn, looking north. 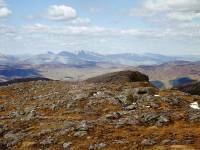 The west cairn from the main cairn - and a magical skyline of peaks including Ben Lomond and the Arrochar Alps. A final summit view; Ben More and Stobinian again. 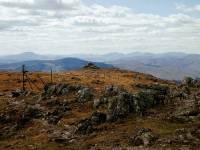 It had taken me five hours to reach the summit from Callander. 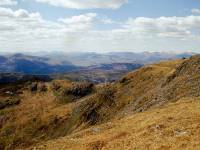 The descent was far easier and I made it back to Callander in three and a half hours, but as I suspected the terrain between the col and the cottage of Arivurichardich was b***** awful and I slipped and fell several times. It's an occupational hazard on boggy terrain, especially when descending. No matter - it had been a fine ending to a fine weekend.